Spiders are one of the most successful, diverse, and sometimes profoundly weird, groups of animals of the world. They range the gamut from: carnivores to herbivores, the highly intelligent to the nearly vegetable-like, active hunters to ambush hunters, tree-dwellers to burrow-dwellers to underwater-dwellers, the highly compact/sturdy to the long/fragile, pitch-black to translucent-white, the camouflaged to the brightly colored, the bird-killing to the fly-catching, the tropical to the temperate, etc. They are found on all continents except Antarctica, rank 7th in total species diversity amongst all other orders of organisms on Earth, and are found in nearly every type of habitat on the planet — other than in the oceans, and in the air. And they have been around for at least 318 million years. Some of the longer-lived species can live for at least as long as 25 years. There are currently 43,678 different known species of spiders in the world. Here’s a list of some of weirdest and most striking ones. Enjoy. The assassin spiders (Archaeidae) are, like many of the other most interesting types of spiders, actually hunters of other spider species. 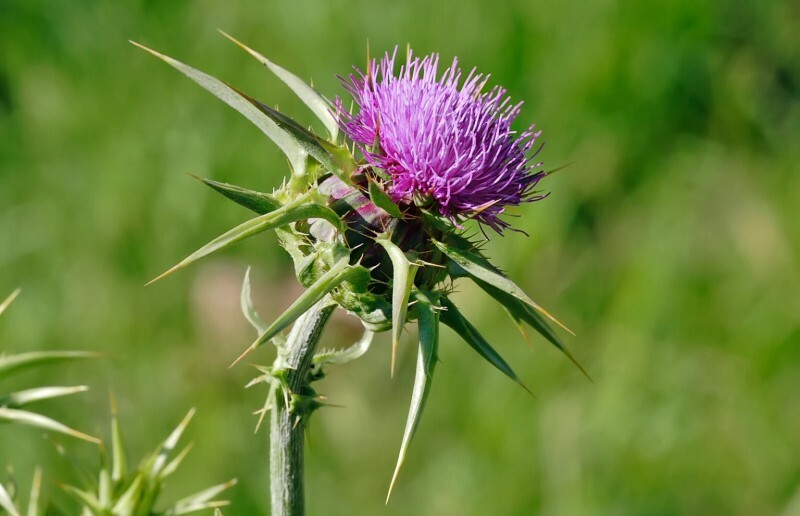 There are currently 25 known species, spread across 3 different genera. They are native to Australia, South Africa, and Madagascar (also the home of other strange, unique animals — the endangered lemur primates for example). The most striking thing about assassin spiders are their necks — which, when in action, give them the appearance of the creature out of Aliens or something like that. They typically grow to reach sizes of 2-8 mm. Assassin spiders were actually first described scientifically from a 40-million-year-old amber fossils all the way back in ~1840 — it wasn’t until many years later (1881) that it was discovered that they were still in existence, in Madagascar. Diving bell spiders are certainly one of the most impressive types of spiders (to my mind). They spend their entire lives underwater — doing everything there: hunting, eating, mating, laying eggs, etc. They only rarely come up to the surface for air (once or so a day, or less), owing to the fact that their underwater scuba-tank-like web-bubbles actually function similarly to a fish’s gill — effectively extracting dissolved oxygen from the water and dispersing carbon dioxide. These underwater diving-bell webs that the spiders (Argyroneta aquatica) create are filled up with air-bubbles trapped by fine-hairs on the spiders’ abdomens when they surface occasionally for air. 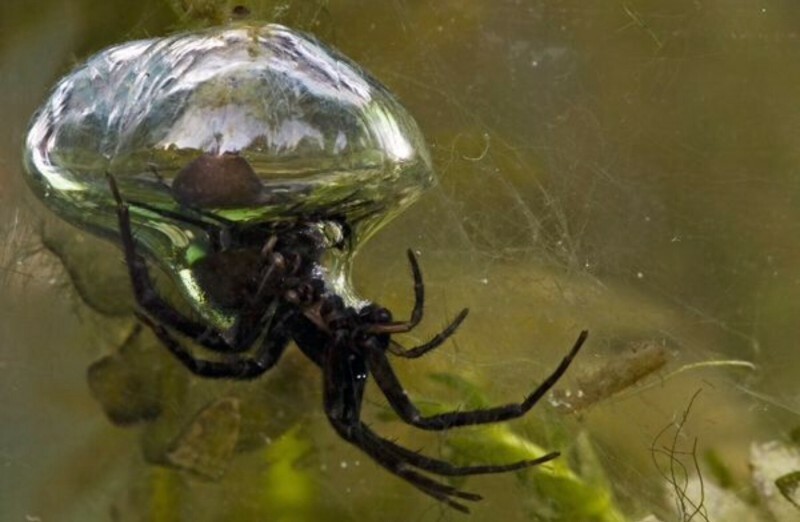 Diving bell spiders are found all throughout the rivers, ponds, streams, and pools of water, of Europe and northern Asia. Portia is a large genus of jumping spiders that are known to hunt and feed-on other spiders primarily — making them araneophagic. They are best-known for the fact that they are highly-intelligent and make use of an incredible number of different hunting strategies, based on their specific prey and the specific circumstances. Research suggests that they are capable of learning and possess complex problem-solving skills — traits which normally aren’t associated with arachnids (whether justifiably so or not). There are currently 17 different known species — spread throughout Australia, Africa, and Asia. Portias often hunt in ways that seem intelligent. Their favorite prey appears to be web-building spiders between 10% and 200% of the Portia’s size. Portias look like leaf detritus caught in a web, and this is often enough to fool web-building spiders, which have poor eyesight. When stalking web-building spiders, Portias try to make different patterns of vibrations in the web that aggressively mimic the struggle of a trapped insect or the courtship signals of a male spider, repeating any pattern that induces the intended prey to move towards the Portia. 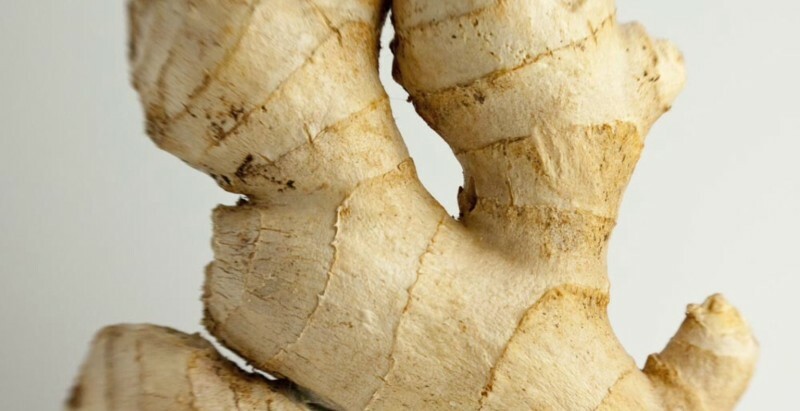 Portia fimbriata has been observed to perform vibratory behavior for three days until the victim decided to investigate. They time invasions of webs to coincide with light breezes that blur the vibrations their approach causes in the target’s web; and they back off if the intended victim responds belligerently. Portias that retreat may approach along an overhanging twig or rock, descend down a silk thread and kill the prey. Other jumping spiders take detours, but Portia is unusual in its readiness to use long detours that break visual contact. Laboratory studies show that Portia learns very quickly how to overcome web-building spiders that neither it nor its ancestors would have met in the wild. Portia’s accurate visual recognition of potential prey is an important part of its hunting tactics. For example in one part of the Philippines local Portia spiders attack from the rear against the very dangerous spitting spiders, which themselves hunt jumping spiders. 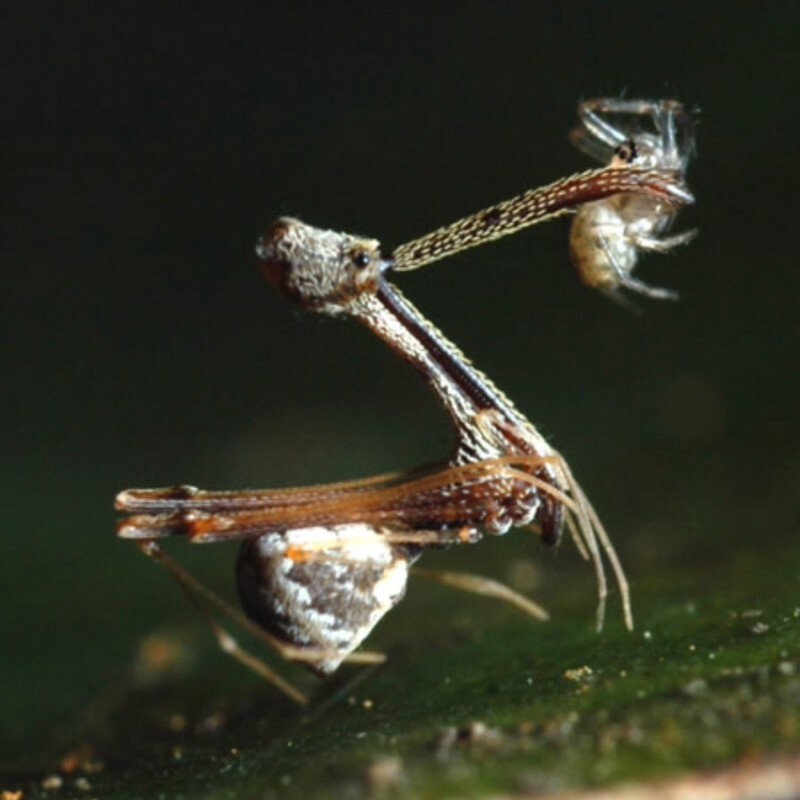 This appears to be an instinctive behavior, as laboratory-reared Portias of this species do this the first time they encounter a spitting spider. 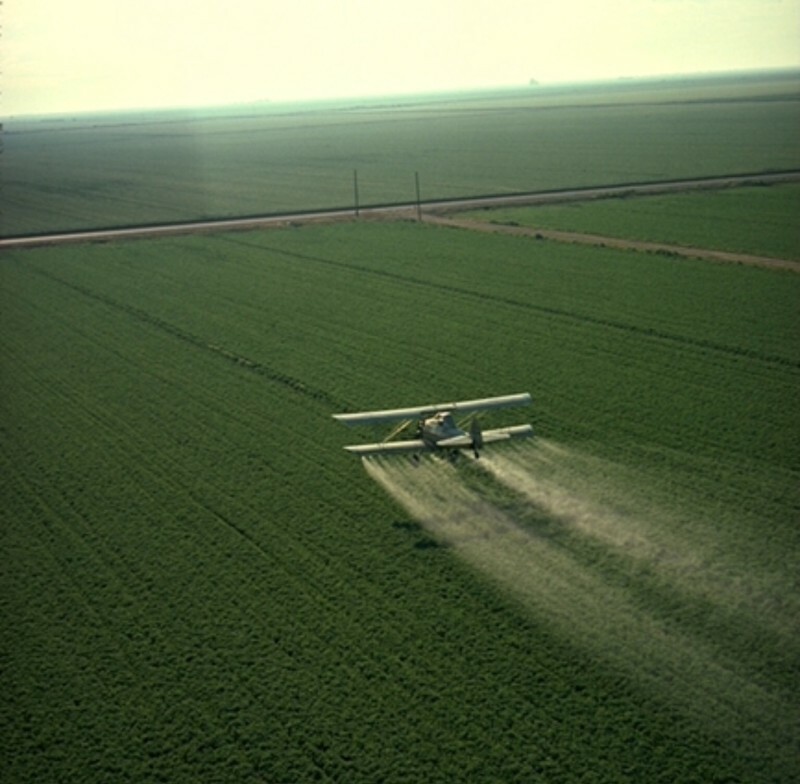 On the other hand, they will use a head-on approach against spitting spiders that are carrying eggs. However, experiments that pitted Portias against “convincing” artificial spiders with arbitrary but consistent behavior patterns showed that Portia’s instinctive tactics are only starting points for a trial-and-error approach from which these spiders learn very quickly. 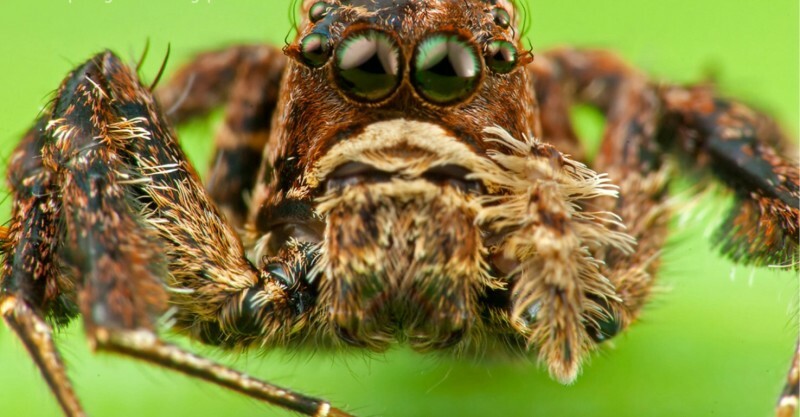 Against other jumping spiders, which also have excellent vision, Portias may mimic fragments of leaf litter detritus. When close to biting range, Portias use different combat tactics against different prey spiders. On the other hand they simply stalk and rush unarmed prey such as flies, and also capture prey by means of sticky webs. Bagheera kiplingi is a species of jumping spider best-known for the fact that it is currently the only known species of spider to be primarily an herbivore. Yep, you heard that right, a vegetarian spider. The species is found throughout Central America — in particular, in Mexico, Costa Rica and Guatemala. 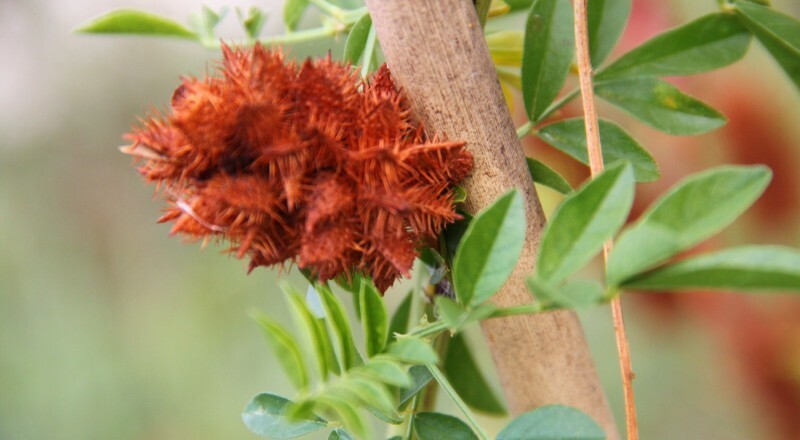 B. kiplingi live-in and spend much of their time in/on Mimosaceae trees — Vachellia in particular. 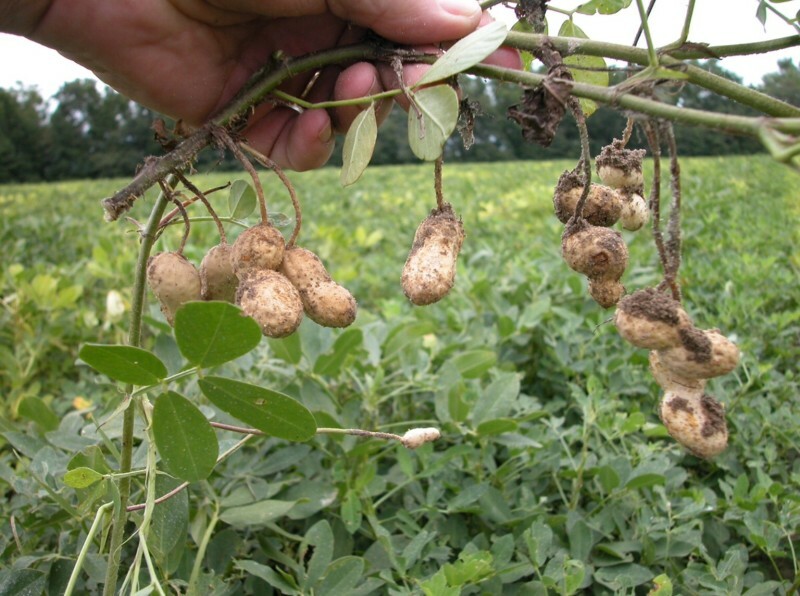 It’s these trees where they get most of their food — feeding primarily on the specialized protein-and-fat-rich nubs (Beltian bodies) that these trees use to feed the ant-species that they are in a symbiotic relationship with. In exchange for access to the nubs, the ant species in question guards and protects the trees against other insects, and even against much larger animals. Bagheera Kiplingi appears to not have too much trouble avoiding these ants though, and actually occasionally steal ant larvae from passing worker ants transporting them. That said, over 90% of B. kiplingi‘s diet is obtained via the Beltian bodies. The rest of the spider’s diet is made up of flower nectar, and the occasional cannibalism — which is apparently most common during the dry-season when other foods are scarcer. Research has shown though that the spiders’ body-tissues exhibit the isotopic signatures typical of herbivorous animals — so such cannibalizing-events must not be all that common. Interestingly, in regions where the trees are scarce the spiders will often converge together in large groups made up of several hundred individuals. Research has also shown that females generally guard their hatchlings and clutches, interestingly — implying protective/parenting behaviour, something somewhat rare for spiders. The Mirror Spider (Thwaitesia argentiopunctata) is a species of spider found all throughout Australia, and most easily recognized by the reflective, metallic patches covering its body. Strangely, these mirror-like patches actually change in size depending on how “threatened” the spider feels. The overall appearance gives the impression of a translucent spider covered in glued-on bits of metal/mirror that are slowly changing/pulsing in a rhythm of sorts — they are really quite strange looking animals. These reflective scales are composed mostly of guanine. The mirror spider typically grows to body lengths of around 3 millimetres (0.12 in) for males, 4 mm (0.16 in) for females. Camel spiders (Solifugae) are an order of animals that currently features more than 1,000 different known species, across 153 different genera. While not technically “true spiders” they certainly resemble them, and are very closely related. 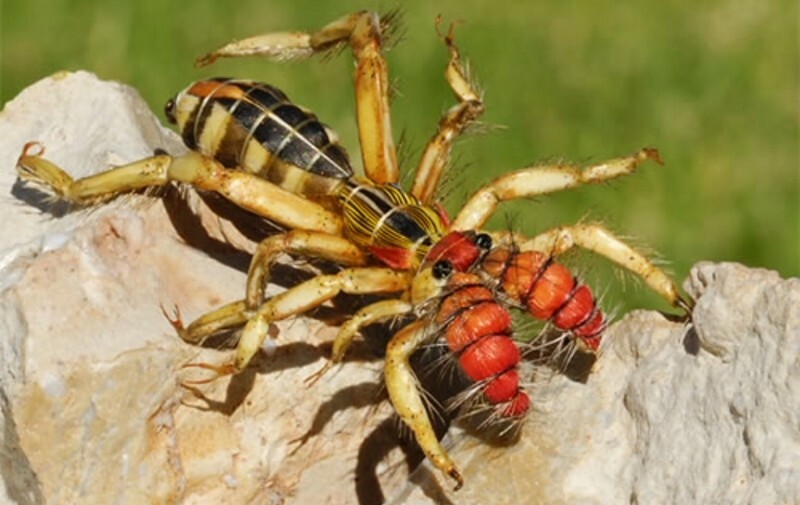 Most camel spider species live in dry, desert-like environments and feed/hunt ground-living insects, lizards, and rodents. The largest species grow to be about a half-foot long on average — but they can get notably larger than that. Despite the many urban legends out there, they aren’t actually all that dangerous (with regards to people). They are aggressive hunters of smaller animals though — and are known to kill and eat snakes, rodents, and lizards. Ant-mimicking spiders are exactly what they sound like. (And what they look like). 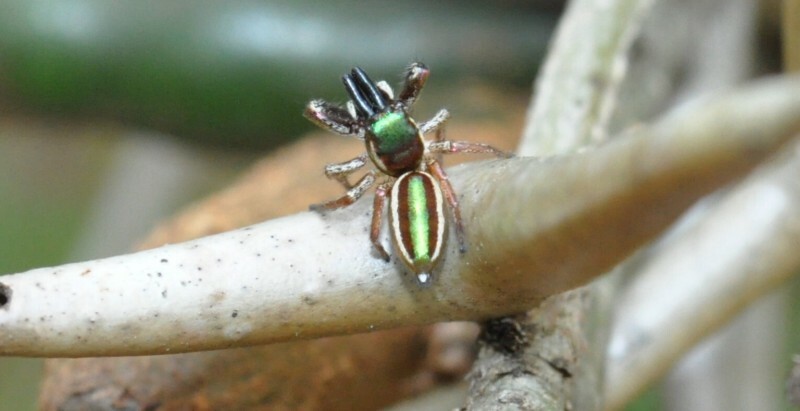 The animals (Myrmarachne) are contained in a genus of jumping spiders that is most noted for waving their front-legs around in the air in imitation of insect-antennas. The spiders are found primarily in Australia, Africa, and, to a lesser degree, in the Americas — as well as elsewhere. 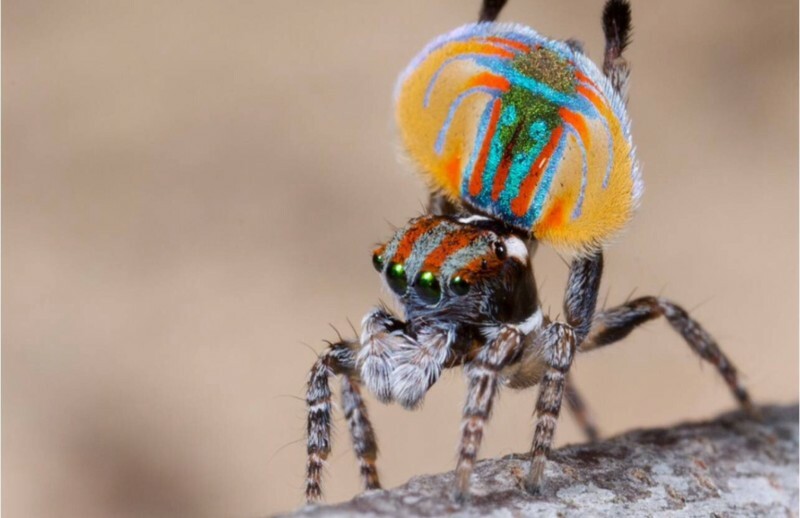 Peacock spiders (Maratus volans) are a very bright, strange, and beautiful (? ), species of spider found in certain parts of Australia — and nowhere else. The red, blue and black colored males have flap-like extensions of the abdomen with white hairs that can be folded down. They are used for display during mating: the male raises his abdomen, then expands and raises the flaps so that the abdomen forms a white-fringed, circular field of color. The species, and indeed the whole genus Maratus have been compared to peacocks in this respect. The third pair of legs is also raised for display, showing a brush of black hairs and white tips. These legs are also used in a clapping motion to further attract a female’s attention. While approaching the female, the male will vibrate his abdomen while waving raised legs and tail, and dance from side to side. Both males and females reach about 5 mm in body length — that lack of sexual dimorphism is telling, as there is a great deal of competition and violence between the two sexes in the species. Out of all of the animals in the world, peacock spiders may certainly have some of the strangest sexual politics. Though a female may witness a male’s dance, she could already be carrying eggs or simply not be impressed. If the male continues his dance when the female is not interested, she will attempt to attack, kill, and feed on him. If the male is quick enough he uses his ability to jump long distances to escape her, if he is not quick enough he is eaten by the perturbed female. This may also happen even if the female is interested and allows the male to mate with her. The behavior of the female M. volans suggests why male Maratus volans have developed unique sexual dimorphic features and courtship behavior. It is important to note that Maratus volans not only use their inherited colorful opisthosomal flaps to lure the attention of the female but much of the mating ritual consist of waving and vibrating the third legs. This calls to question, why peacock spiders do not stick with just one signal in order to lure a female? The Maratus volans mating ritual can last anywhere between four and fifty-minutes. That is a lot of time and energy invested into a female that may not even mate with that particular male. What was just described is an example of runaway sexual selection model. In the runaway sexual selection model, it is to be assumed that “If the genetic correlation between trait and preference is extremely high, this system can “run away” in a positive feedback loop, like a snowball rolling down a snowy mountain and accelerating as it becomes larger and larger.” An effect of this would be that across many generations, male coloration would become more and more elaborate because the male gene for color and the female gene for preference are linked. It should be noted that the runaway sexual selection model and good genes model of intersexual selection are difficult to distinguish from one another. One distinguishing characteristic of the runaway sexual selection model is that the evolution of the selected gene can be detrimental to either the male or female. Because the male risks death in attempting to mate, the runaway sexual selection model is used to describe Maratus volans. 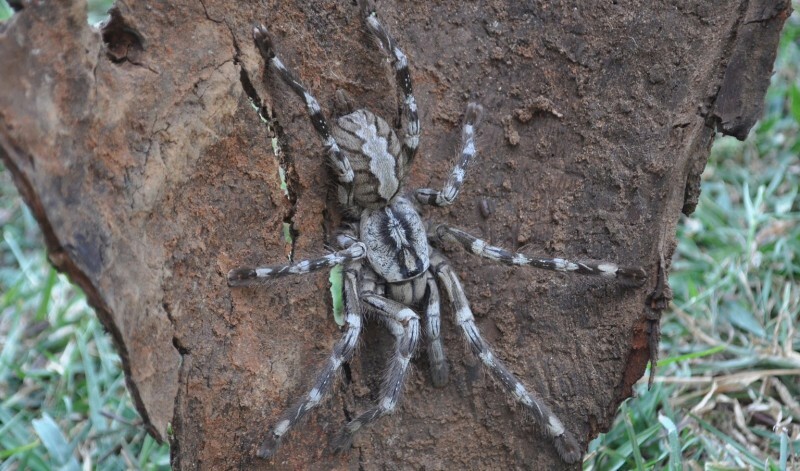 One of the many different spider species known as “tiger spiders” is Poecilotheria rajaei — one of the largest species of tarantula in the world. With the adults possessing an average legspan of up 20 centimetres (8 in), they are of similar size to an adult human’s hand. Think of something maybe a bit like the “face-sucker” from the first Alien movie and you’ve pretty much got the idea. The species is generally found in old-growth trees, but owing to large-scale deforestation in the spider’s home-range in recent years they are now found more often in old unsure buildings — they are also getting to be quite rare. While the venom of Poecilotheria rajaei is fairly potent, it’s not strong enough to kill a human — but it is strong enough to kill birds, snakes, rodents, and lizards, the animal’s primary prey. With deforestation becoming more and more of an issue in the region, the future of the species isn’t looking good. Trapdoor spiders (superfamily Ctenizoidea, family Ctenizidae) are a very interesting group of spiders known for their ingenious use of disguised “trapdoors” from which they stage ambushes. They live most of their lives in these self-constructed burrows outfitted with a cork-like trapdoor made of soil, vegetation, and spider-silk. 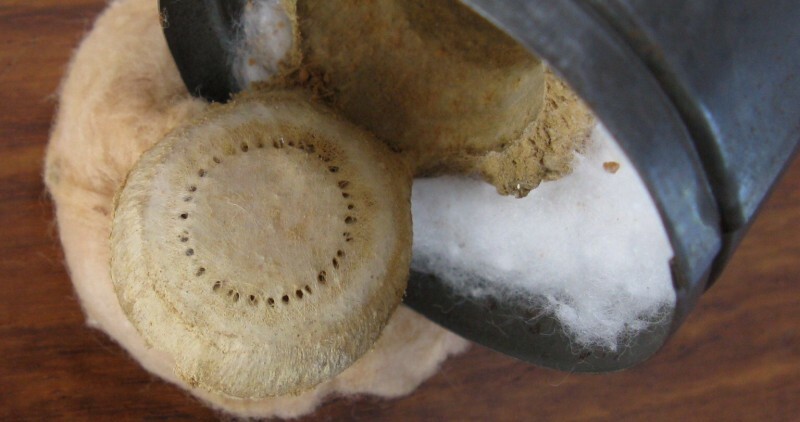 The trapdoor is hinged with spider-silk. These trapdoors can really be quite hard to spot, making it very hard to gauge population numbers — as a result, the population-health of the various species is unknown. The spiders, which are usually nocturnal, typically wait for prey while holding on to the underside of the door with the claws on their tarsi. Prey is captured when insects, other arthropods, or small vertebrates disturb the ‘trip’ lines the spider lays out around its trapdoor, alerting the spider to a meal within reach. The spider detects the prey by vibrations and, when it comes close enough, leaps out of its burrow to make the capture. Before then withdrawing back to its burrow to consume the meal — where it will be quite well hidden. In contrast to all of the other mygalomorph spiders, the Ctenizidae possess a rastellum on the chelicera. These teeth/barb-like modifications allow the spiders to more easily dig and gather the materials used in constructing the burrow and trapdoor. Interestingly/humorously, when disturbed they will actually hold the trapdoor shut by grabbing ahold of the “handles” with their pedipalps and front legs. 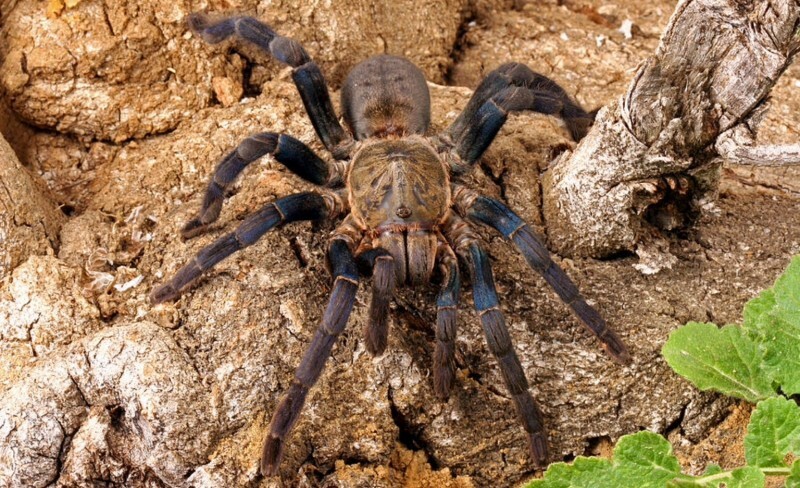 The Cobalt Blue Tarantula (Haplopelma lividum) is a type of tarantula that’s native to the rainforests of Southeast Asia. The species is best known for its striking blue color. 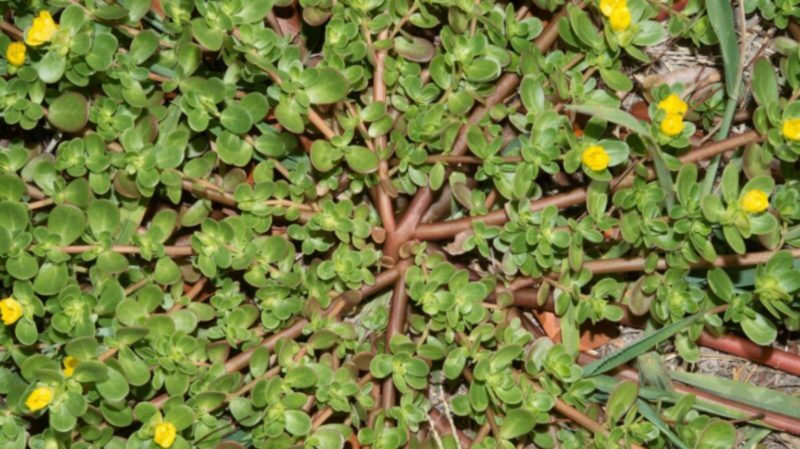 It grows to be about a half foot in length, with males and females being of similar size. Females live notably longer though. The species spends the majority of its life in deep, extensive, self-constructed burrows — typically only leaving to hunt. Hi, I just returned from St. John VI, and was doing some research on the Nephila clavipes, for a new video release. In my searches I stumbled upon this site which has been an amazing find! I really appreciate all the great shots of the spiders that were featured and the narrative was outstanding; very factual, interesting, with an added touch of humor thrown in for a smile! I hunt spiders and consider myself a home-grown naturalist; maybe best titled a “citizen’s expert”! lol I host a channel on YouTube and I’m known around the world as “Bob The Spider Hunter.” Anyway thank you for all your hard work, and an awesome post that I will visit often and refer others too as well.